I am loving your responses to yesterday’s Monday Man-Day post! Sounds like most guys that drink coffee stick to black. Last night my family went out to dinner for my Dad’s birthday. The restaurant, which we had been to before, is called Niche and is very well-respected in St. Louis. It’s the type of place that only has about four choices for entrees, but they each have unique ingredients and are well prepared. Yesterday at work I checked the menu online to see what my vegetarian options would be and I noticed it said that Mondays featured a special “Comfort Food” menu. *uh oh*. Comfort food doesn’t bode well for a healthy-eating vegetarian. I decided to call the restaurant and see what was up. It was a good thing I did because there were only two options that night – a chicken and a beef. But the chef was more than willing to prepare a dish for me, which was greatly appreciated. I don’t often call restaurants ahead of time because it makes me feel like a picky, obsessive eater, but in the situation it was definitely beneficial. I ended up with one of the most delicious meals I’ve had in a while! 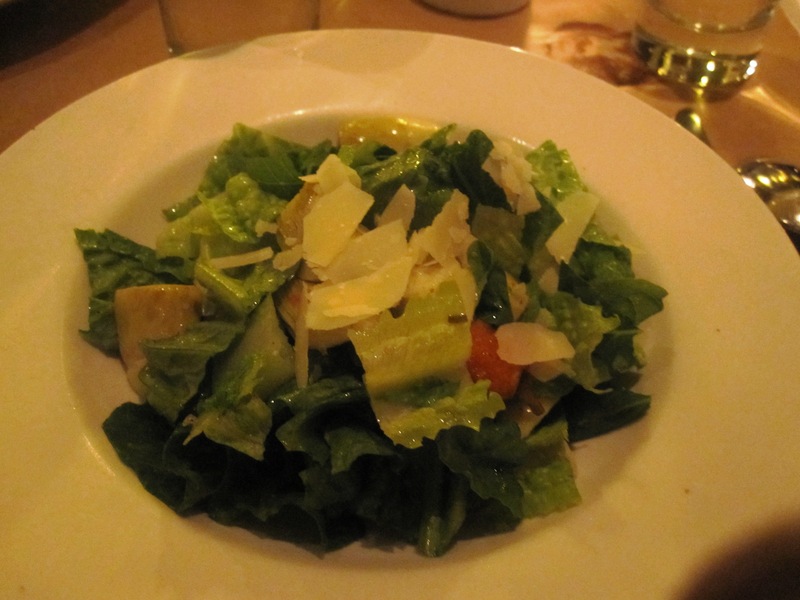 Instead of the pork shoulder appetizer, the chef prepared me a salad with artichokes, carrots, and shaved cheese. It had a light and mildly salty dressing on top. And dessert wasn’t an issue. 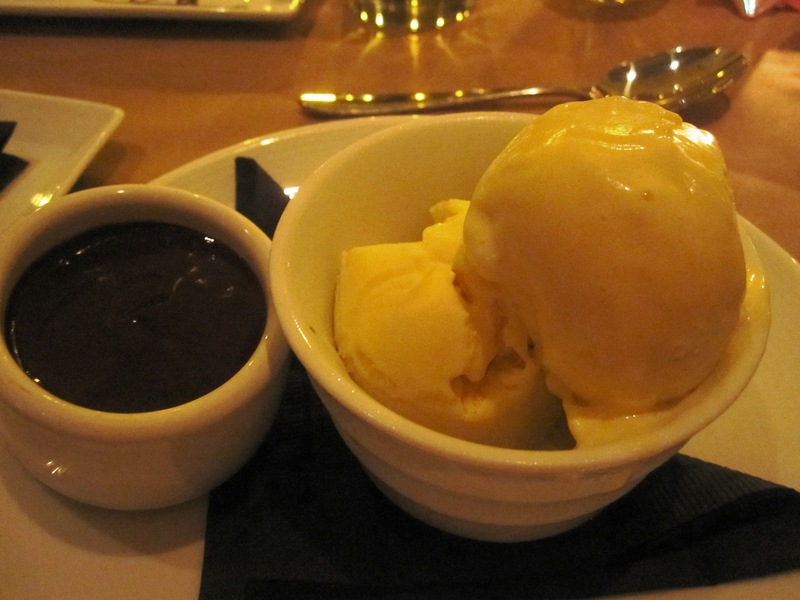 I went with homemade vanilla ice cream and an insanely rich chocolate sauce. I ate every bite of this meal and left perfectly satisfied but not stuffed. I am so impressed with Niche’s willingness to accommodate me and cannot say enough good things about the service, ingredients, and taste of everything I ate. Have you ever called a restaurant ahead of time to make sure you can get the meal you want? Now that I know how easy it is and how much better it can make my dining experience, I may do it more often. This morning I was up and at ’em for 6am spin class. I love getting in a leg work out along with my cardio. I generally ride about 18 miles in one class…no idea how that compares to others. After I was sufficiently sweaty, I completed a full body weights work out. I made up my own circuits of upper body and lower body exercises and completed 3 sets of each. So glad I’m incorporating more strength into my routine now! I’m trying to gradually start upping my weight so I really push myself. 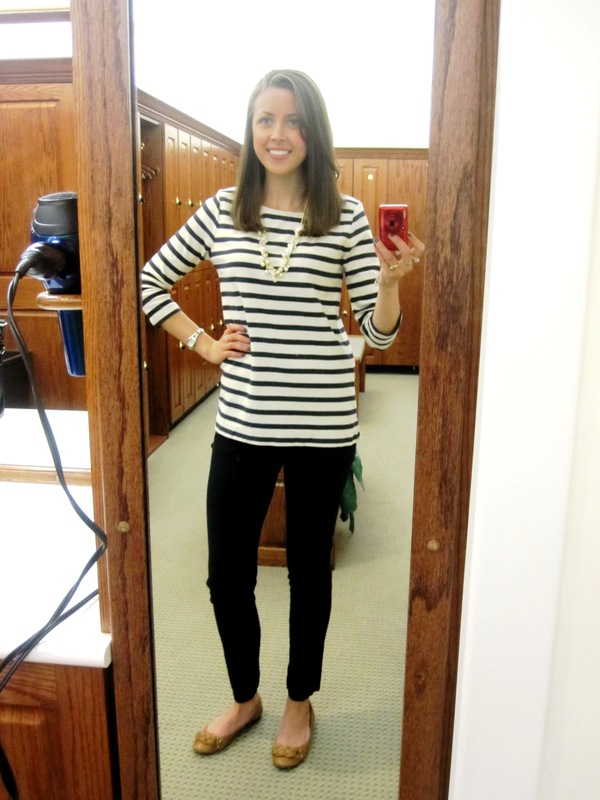 This striped top might be my favorite purchase from the J.Crew Outlet. I love how simple and classic it is! 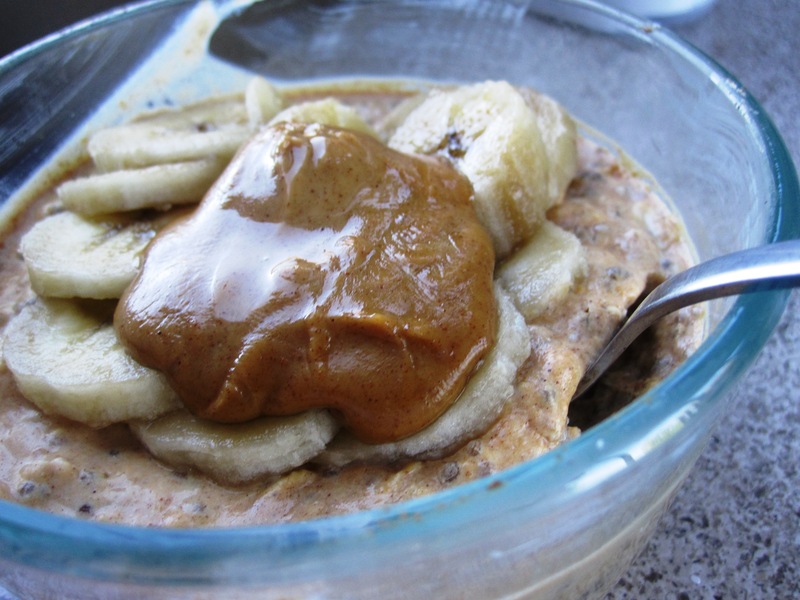 I mixed that all up and then topped it with 1/2 banana and a spoonful of almond butter before placing it in the fridge to thicken. mmm I was kind of bummed about having to use pumpkin all week, but now I remember how good it is! I am just trying to figure out if I like the almond butter and pumpkin combo…not sure about it yet. Have a great Tuesday everyone!! ← Monday Man-Day: Real Men Drink Coffee? Calling ahead is a great idea. Usually higher end restaurants are more accomodating than chains. It’s always nice to not have to order pasta! Wow, so nice that the chef was so accommodating! The pumpkin oats look amazing. I just finished off my last can of pumpkin, but now you have me wanting more! I love your shoes! Would you mind sharing the brand? I’m all about calling ahead! 🙂 (If the restaurant blatently has no options on the menu for me, that is.) It’s helpful for the restaurant becasue they get a head’s up, and it prevents me from having to be picky DURING dinner (I hate that, too!!). thats so nice he made you a special dish! ive never called ahead– welll never have had to yet! By the way I love your shirt! Ah, I have always thought about calling ahead especially when I know there will be nothing available to me and the menu is so small because I hate to be such an inconvenince! On Sunday, I went on a first date.. to a steak house, the first thing I thought was this is going to be a fail right off the start. I figured there would be no vegan dishes, but I made do with that I could because I clearly was not going to complain on my first date haha. PS he know nows that I am a vegetarian and I am lactose intolerant haha. Your custom made dinner looks wonderful!! I’ve had that happen once to me. I’ve never called ahead, but I was at a pretty well-respected Mexican restaurant with my mom and brother and I couldn’t find anything. They made me a delicious salad full of tomatoes, black beans, carrots, etc. and TONS of chopped avocado. I told them it needed to be on the menu! 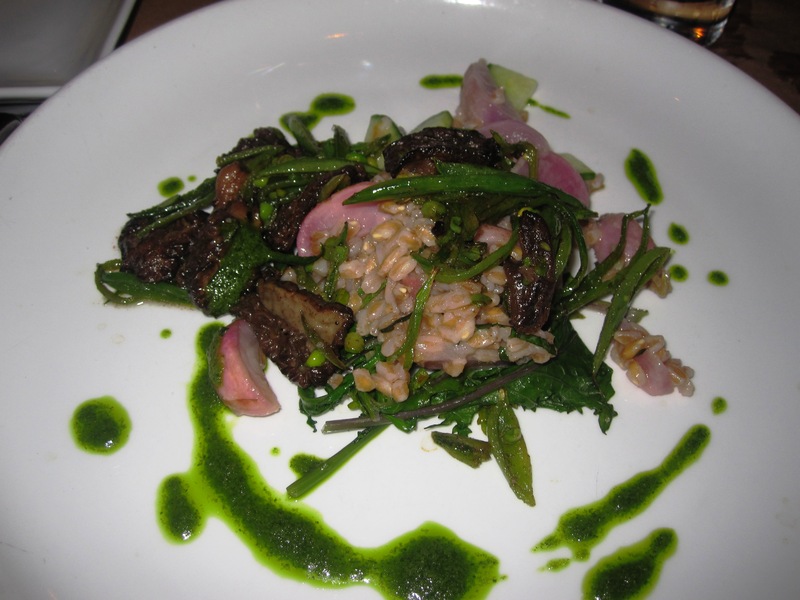 You’re the second person to mention farro today, and before today I’d never heard of it! I’ve never called ahead. What a great idea. I’ve never called ahead but I think that it is a great idea! 🙂 That dinner looks amazing! i LOVE Niche!! def one of my favorites here. now im even more smitten with the place knowing how accomodating they can be! Scrumptious! That was a very accomodating restaurant… 5 stars for fixing that meal for you! I don’t usually have to call before hand, most restaurants where I live are very accommodating places so its not an issue most of the time. Just curious, how do you know how many miles you usually cover during a spin class? I’m loving pumpkin right now!